Pick a carrier, any carrier. We've got you covered. From Business Cards to Door Hangers, we can print almost anything. From peanuts to bubble wrap, tubes to intricate crating, we have all the packaging materials you could ever use. Whether you need one one copy or one million, we have you covered. The Mail Center: We Do It All! Pick a carrier, any carrier! The Mail Center doesn’t limit you to just one or the other. We have Access and agreements with all of them. 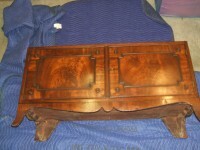 We have over 25 years experience packing Everything from Art and Antiques to Glass, furniture and Electronic Equipment. 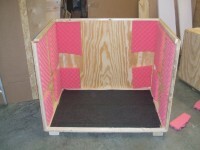 We build custom crates at Our store or at your location. Ever wonder where to get all your moving supplies in one place? Well we’ve got what you Need. Ever need full color brochures, business cards, post cards, stickers, envelopes, letterhead, flyers, forms, posters, Rack or counter cards? We got em. Some of the cool things that can be printed in large format are event banners and signs, sports posters, school events, neighborhood, social or business events and just about anything else you can think of. Black and White, or color we have the high speed equipment to print 10 copies or 10 million pages quickly. Full Color passport photos taken everyday in less than five minutes. Need Notary & Fingerprinting? We've got you covered! Do you need a place to receive your mail and have someone sign for all your packages? Do you work odd or shift hours and need 24 hour access to your box? The Mail Center can help. Bronze Sculpture, Crating, Packing and Shipping. Our latest crating job! Beautiful and intricate Bronze Indian Chief. Note foam wrap and custom blocking. Chair? Art? or Both? Crated, Packed and Shipped. Is that fragile? 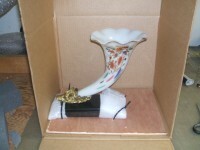 Packing and Shipping two Antique Glass Horns of Plenty. The Mail Center acquires Ricoh Digital Printing Press. 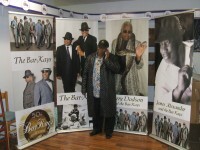 Having fun with the Bar-Kays! How to Pack and Crate Two Small Chests. How to Pack and Crate Two Serving Tables. 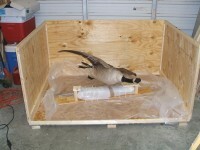 Crating, Packing and Shipping a Flying Goose!